This weekend was a fiiiiine weekend. Fine fine fine fine fine. And as I sat on the tennis court yesterday afternoon, I began to ponder just what it is that makes summer such an exultant time of year. And then it came to me like enlightenment to a Yogi... PING! Just like a light bulb floating above my head... COLOUR PEOPLE! Colour is the elixir of summer. Colour is to life what spices are to cooking. Colour languidly materialises as the strength of the sun grows. Yes, COLOUR! And so I proceeded to rummage through my impeccably organised sunglasses drawer (all in alphabetical order, naturally), my bulging scarf rack and the 'miscellaneous accessories' confines of wardrobe A and threw together three components that allowed that incomparable summer feeling to manifest itself, whirling like a phoenix within my optimistic flames of thought. COLOUR! PATTERN! SUMMER! 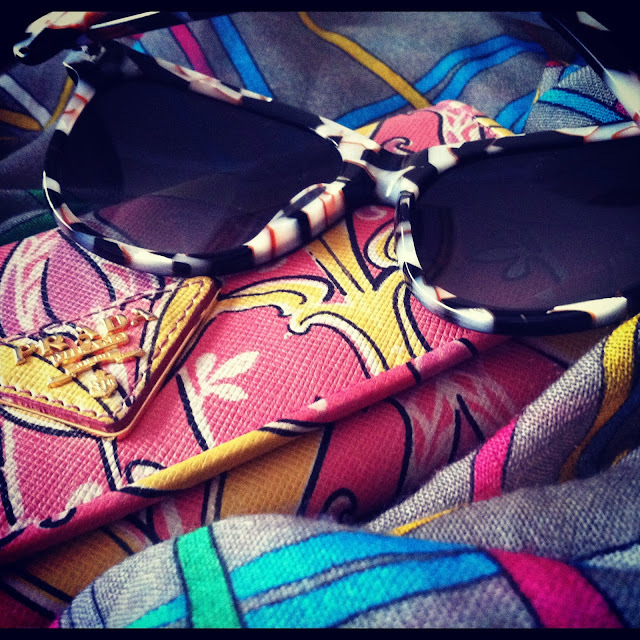 And there we have it - summer in a Prada wallet, Diane Von Furstenburg sunglasses and a Jonathan Saunders scarf. Bravo.